Arianespace’s future launchers, the Ariane 6 and Vega C, have moved into the next phase of their development, following the signing of contracts – between the European Space Agency, Airbus Safran Launchers (ASL), France’s CNES space agency and ELV – on Wednesday. 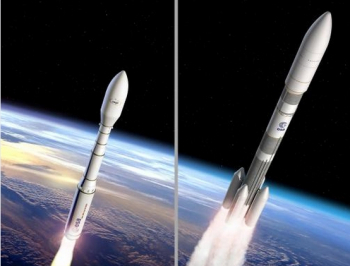 Ariane 6 is expected to conduct her maiden flight in 2020 while Vega C will come online in 2018. 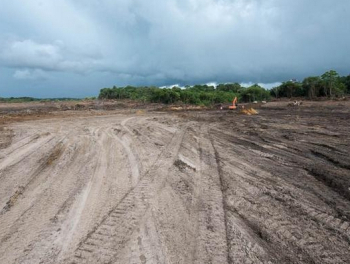 Arianespace currently boasts a family of three rockets at its European Spaceport base in Kourou, French Guiana. With the introduction of Soyuz rocket at the Spaceport in 2011, Arianespace conducts a multitude of missions with its range of launchers. Soyuz has since been joined by the lightweight Vega vehicle, following her successful debut in 2012. However, the Arianespace workhorse is the Ariane 5, which still has a long career ahead of her. That career, however, will come to an end, via her successor – the Ariane 6. The three-stage vehicle will be capable of lofting 4.5 ton payloads to polar/Sun-synchronous orbits missions at 800 km altitude and between three and 10 tons on GTO missions. The vehicle’s main stage utilizes the liquid oxygen and hydrogen Vulcain engine of Ariane 5 ECA and ME, complimented by two – or four – P120 solid rocket boosters. It will also sport a cryogenic upper stage (LOX/LH2) propelled by a Vinci engine, based on the A5ME upper stage, with limited adaptations. Ariane 6 will sport both A62 (for two boosters) and A64 (for four boosters) configuration. The horizontally integrated – a first for Arianespace – rocket will be launched from a new site at Kourou, to be known as ELA 4. Prime contractor CNES is already excavating the area for the new complex will also include facilities for preparing the launcher for her missions. French Guiana’s near-equatorial location – which is ideal for the launch of satellites into geostationary orbit – was one of the main reasons behind Europe’s decision in 1966 to build a launch base in the country and for its continued operations in South America. The P120 solids will also star with the Vega-C – an evolution of the current Vega launcher. The P120 will replace the P80 motor currently used on the standard Vega rocket’s first stage. During her early career, she proved her versatility by successfully lofting a range of spacecraft into orbit. She also lofted the Intermediate Experimental Vehicle (IXV) earlier this year. Per the announcement that the contracts had been signed at ESA’s Paris Head Office with ASL, CNES and ELV, respectively – the green light has been provided to cover all development work on Ariane 6 and her launch base for a maiden flight in 2020, and on the Vega C for her 2018 debut. “These contracts will allow the development of a family of European launchers, highly competitive in the world market and ensuring autonomous access to space at fully competitive prices for ESA’s Member States,” noted Jan Woerner, Director General of ESA. 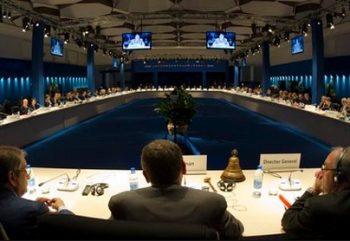 The three contracts follow the decision taken at the ESA Council meeting at Ministerial level held in Luxemburg in December 2014. “With the signing of these contracts we are on track on building a new family of launchers featuring common building blocks, in line with the decisions and schedule set at the Ministerial Meeting in 2014,” added Gaele Winters, ESA’s Director of Launchers. The contract amounts are €2400 million for Ariane 6 (ASL), €600 million for the launch base (CNES) and €395 million for Vega C (ELV). (Images via Arianespace and ESA).